While everyone gets an idea of all of the exciting engineering tests and evaluations going on this week in Key Largo, Fla. for the upcoming NEEMO 15 mission from these daily blogs, not many folks know about what goes on behind the scenes to inform YOU about what’s happening with the day-to-day activities. What it takes to get the word out, what it takes to let you in on the cool tests and evaluations that these hardworking engineers perform undersea and on the ocean floor at the Aquarius habitat, and what it takes to bring the action to you, so you can enjoy it, interact with it, learn from it, and be inspired by it. One method would be a blog, just like this. Another, perhaps a press release or media advisory or interviews with media outlet, or maybe one of those new fancy social media outlets. Who updates those and answers all of the questions? What about all of those cool photos… who takes them, who organizes them, how are they stored? And let’s not forget about those really awesome live interactive education events! How in the world do you coordinate getting into a classroom full of kids in a remote location, tying in an education specialist at Johnson Space Center, adding a live video feed from a boat out at the Aquarius, talking live with a person at the Aquarius Reef Base Watch Desk, and interactively chatting online at the website where the live video feeds? How we inform the media or public, how we bring live education events to classrooms, how we document and record the mission, takes more than one person and more than one asset. It takes a team of people located in different centers and some on-site, to know all the technical details of the mission and to be able to follow what is happen throughout the day to entertain, interact with, inspire you. So, here is an snapshot of our Education and Public Outreach activities that happen on a typical day during our NEEMO mission during our engineering evaluations. We start our day bright and early, with our all-hands meeting with the NEEMO mission manager. From there, we get ready for the rest of outreach activities throughout the day. For example, set up a phone interview with a national media outlet, conduct recorded interviews with subject matter experts for use during live events or in the case of a communication issue during a live event, write a basic script and coordinate and test the communication equipment and phone lines for interactive education event that will occur the following day, continually update Facebook and answer questions, tweet throughout the day and respond to questions on Twitter, meet with the engineering team when they get back from their day activities, download all of the photos and videos taken throughout the day to a server, sort through and pick favorites to upload to Flickr and write captions for those. Coordinate a photo shoot at mission control. Write a blog, such as this! Set up for a live distance learning (DLN) event and execute it.. Pretty crazy, huh?! And then, the day ends by documenting all of the work, lessons learned, preparing for the next day, and it all starts all over again the next day. Engineer divers get ready to install the translation tool simulator into the wall. The NEEMO-15 mission will be in October, and in an engineer’s mind, that means there’s still time to iterate on designs. Today the engineering team took some of those designs into the field. One of the devices tested today was a “spacesuit waist ring simulator.” It acts as the waist structure of a spacesuit would, except it’s attached to a diver wearing SCUBA tanks. It holds EVA tools, provides stability against structure, and even blocks some of the view, just as a spacesuit’s waist ring would. So today, after constructing this device in labs and workshops, it was finally time to put it in the water. After estimating it’s weight and buoyancy (and yes, there were bets on whether it would float! ), it finally had its first taste of the ocean while still dockside. It checked out, as did the other tools and giant fiberglass “rockwall” that some of the experiments would mount to. So after the paperwork was all signed off, the team set out to the reef. When arriving at the site – on the same reef but some distance away from Aquarius – the team lowered the rockwall to the ocean floor. Then, one-by-one, test subjects, utility divers, and support divers worked through their checklists and started the clocks on their dive. Astronaut Mike Gernhardt, the test subject actually in the “rig,” found the buoyancy to be near perfect (something that can sometimes take 30 minutes to correct), and started the experiments right away. The first thing that struck everyone was the visibility – the bright sunny, calm day helped the lighting – but the silt being kicked up made it impossible to see further than 10 feet. For the most part this didn’t affect the experiments, and the team pressed ahead. They tested hand-over-hand translation with anchor points on the rockwall, foot-restraint ingresses, anchoring in the silt to stabilize the setup, and using a rigid standoff attached to the waist ring for body stabilization. All while their time was ticking away – and they were not able to speak to each other. This was shaping up to be quite the debrief session. 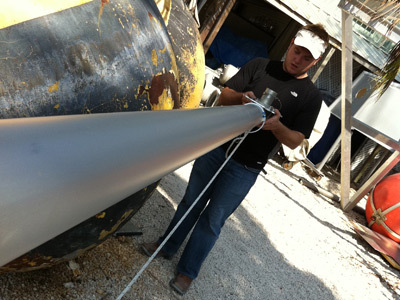 This tool will be an anchor and the aquanauts (or divers, in this case) will use the different lines to translate in the surface of an asteroid. Once back on the boat, the crew discussed what they had learned. Either luck or excellent prediction had caused the rig to be perfectly buoyant, but some stabilization was needed on the waist ring – and the fins – they proved to be positively buoyant by sending the subject’s feet sinking after they were removed. Mike was happy to share an interesting discovery: while holding an excursion line anchored in two locations on the “asteroid,” one could effectively pull against the surface and walk, just as if there was gravity! There were other lessons learned, and many adjustments that would need to be made overnight and in the next few days, so the team used the trip back to base to rest and, well, talk more about the big picture. I guess you could call it an engineering brainstorming session. Not one with whiteboards, flowcharts and venn diagrams, but just bunch of people, passionate about space exploration, talking on a boat. They all had huge variations in their backgrounds and individual training, and just witnessed a sampling of how difficult it would be to possibly someday explore an asteroid. Were the issues they saw today the same ones would be face on an asteroid? No, but some of them were strikingly analogous: The near-zero visibility had a similar effect to what could happen after touching the surface of a dusty asteroid. Body movements made on the ocean floor while “almost” neutrally buoyant are similar to what astronauts would face when moving across the surface of an uncharted asteroid. And how will we know what anchoring techniques would be effective? As the team neared the base on the shores of Key Largo, their conversation shifted to the varieties of anchoring tools we use here on Earth. Not knowing what kind of surfaces are out there is making us consider a variety of approaches from many “analogous” situations here on Earth: rock climbing, foundation repair, even drift diving. This was just a snapshot of one day of experiments in preparation for the NEEMO-15. The countless hours that go into getting ready for a mission are one of the many similarities to NASA’s space missions. Significant is the fact that NEEMO-15 will mimic something that has never been done by humans before. The question could be posed: Isn’t this just a combination of what we have done in the past? Combine the weightlessness, tethering and translation techniques on the International Space Station, and then add to that all of the knowledge gained putting human feet on another world during the Apollo program. Right? Not quite. The final discussions of the evening (after hours of replanning, retooling and regrouping) were about how asteroid exploration is definitely the most challenging of both worlds. Exploring a possibly dusty, wholly unknown, completely uncertified, essentially weightless, “surface” of an asteroid, would definitely be more challenging than combining the sum of our lessons learned from the Moon and ISS. Those experiences under our belt will be the basis of much that NASA does in the future – but we all agree it’s a good thing we’re learning how to hone our skills, here on Earth. A close-up shot of the hand translation simulation. 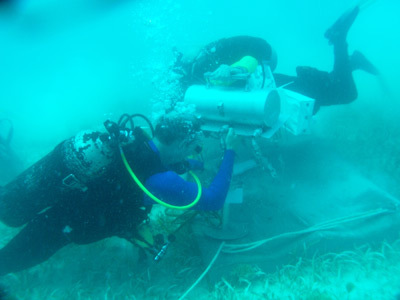 NEEMO 15 support crew setting up devices to be used in the mission. 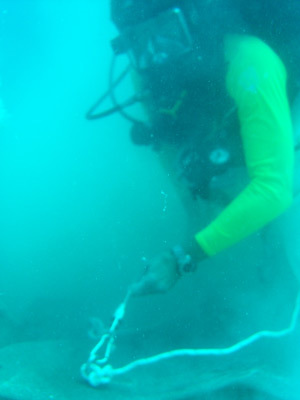 Today was a busy day in Key Largo, Florida for the support crew of the NEEMO 15 engineering tests. 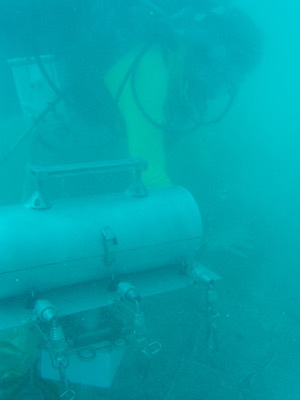 Personnel of NOAA’s Undersea Research Center, or NURC, were busy activating the Aquarius and preparing for this week’s intense diving operations. They left the dock here at the shoreside support facility, aptly named Aquarius Reef Base (ARB), early this morning and were out conducting operations at the Aquarius site, approximately 5 miles south-southeast of Key Largo. They started up the generators and compressors on the Life Support Buoy (LSB) directly above Aquarius. The LSB has an umbilical directly down to Aquarius to supply it with fresh air, electricity, and communication links. Divers then descended to Aquarius and powered up all the systems and tested the communications equipment in preparation for the week’s upcoming events. 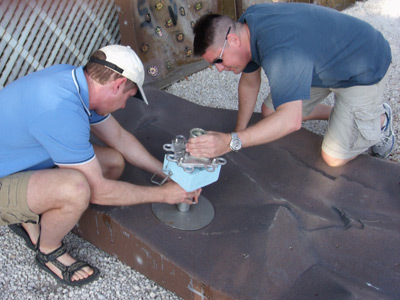 NEEMO mission specific tasks were also performed, such as setting up portions of the rock wall, and testing the remotely operated vehicle (ROV). While all this was going on offshore, the NASA support team was busy onshore at ARB assembling structures to be placed on the seafloor such as mock-ups for the Multi-mission Space Exploration Vehicle (MMSEV) and suit port alignment guides (SPAG), anchoring and tethering devices, translation hardware, and telescoping booms with foot restraint devices. Additionally, they conducted familiarization training on the diving equipment, and checked out equipment to be used on the week’s intense dive operations, to begin tomorrow. Safety briefings were given by the NURC personnel and swim tests were conducted on those dive team members who were either new to the project, or no longer current by NURC’s guidelines. Several runs to the local dive shops and hardware stores were needed to make up for any shortcomings in the original logistics. NEEMO 15 support crew member assembling structures for dive operations. 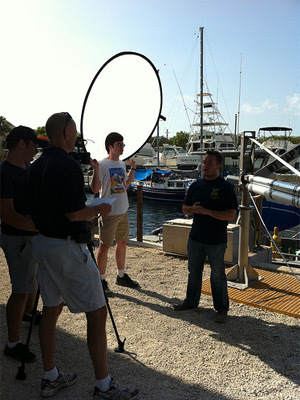 Numerous interviews were recorded with subject matter experts on various NEEMO hardware and ROV operations. An all-hands briefing was held in the evening, going over the day’s accomplishments, and previewing tomorrow’s planned diving operations.